I love this time of the year! It’s Fall and this is the month that we celebrate Thanksgiving. 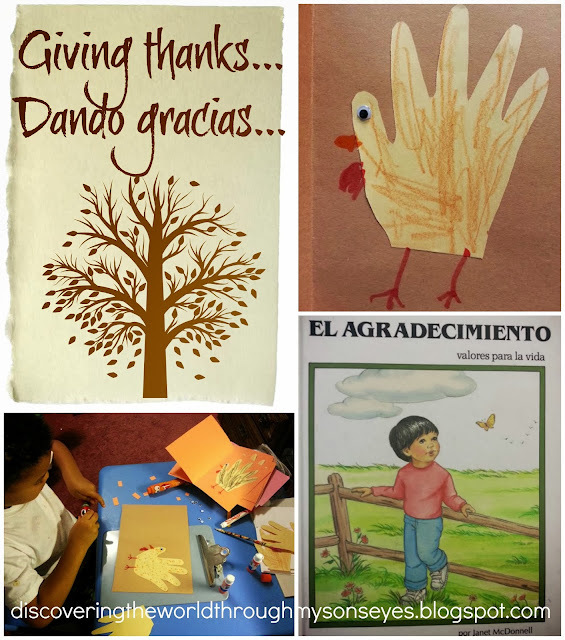 We are having fun making a simple Thanksgiving “turkey hand-print” cards, and giving thanks for all of our blessings. We read a book that my sister in Puerto Rico sent to us some time ago titled: El Agradecimiento by Janet McDonnell. It’s an easy to read book about gratitude with colorful illustrations. Gratitude is what you feel when someone sings a song to you because you can’t sleep. Agradecimiento es lo que sientes cuando alguien te canta una canción porque no puedes dormir. In the end the author points out that if you look closely there are many things to be grateful for. When you’re grateful you feel happy, and fortunate. Then I asked little one, what was he grateful for. He answered in both Spanish and English. 🙂 Proud mommy moment! Can’t wait to mail out little one’s turkey hand-print cards! What fun things are you doing with your little ones this Thanksgiving? Please comment, like, share or pin! Just hover over the picture and you’ll be able to pin right away. That book sounds awesome and I love the handprint Turkeys! Great cards, and love the book! Very proud mommy moment! And you've reminded me that I need to get started making some cards, too!